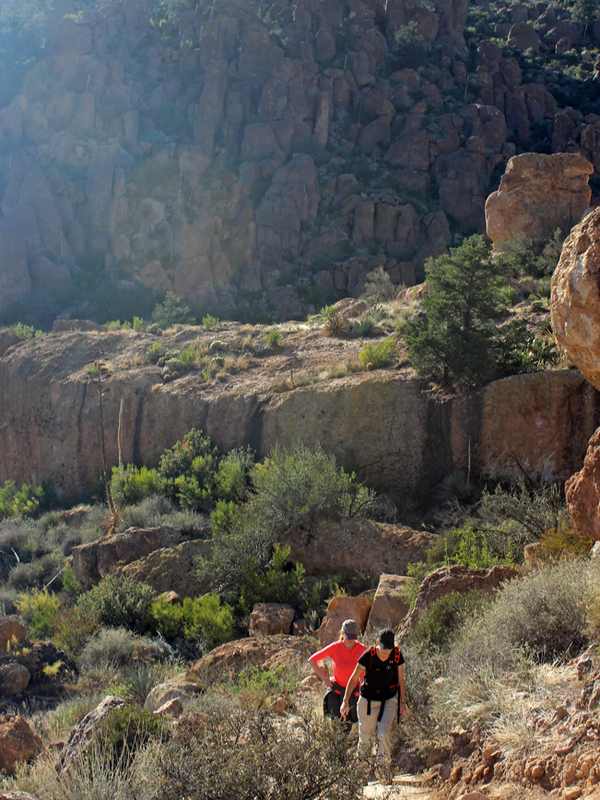 A stone skyscraper, taller than the Chrysler Building, is the star of this back country trail. 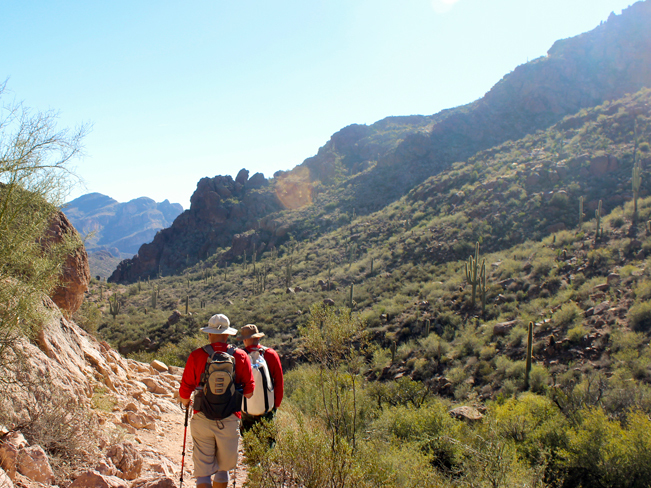 Slicing diagonally across the gorgeous Superstition Mountains, the Peralta Hiking Trail ascends to an inner valley saddle offering Instagram-worthy views of thousand-foot-high Weavers Needle. 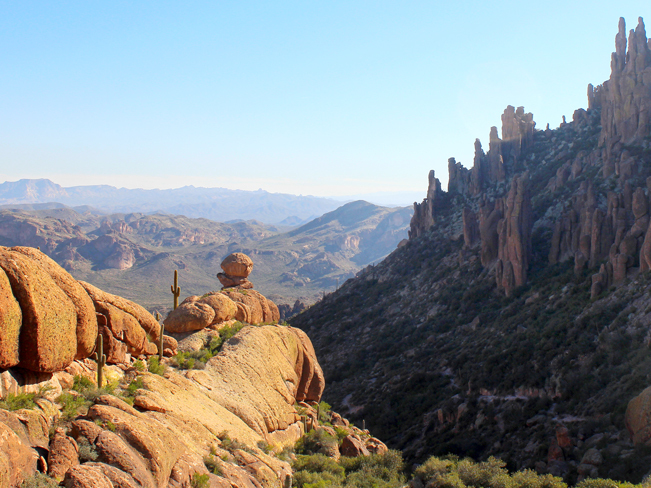 Some of Arizona’s most breathtaking natural wonders are tucked into the Superstition Mountains. And Weavers Needle ranks as one of the best. Jaw-dropping views of this thousand-foot-high volcanic skyscraper extend generously outward from Freemont Saddle on the Peralta Hiking Trail. As a bonus, the trail itself is gorgeous – ascending a hoodoo-lined valley to this popular vantage point. Even the drive in to the Peralta Trailhead is stunning, passing long canyon walls, and Saguaro studded desert. 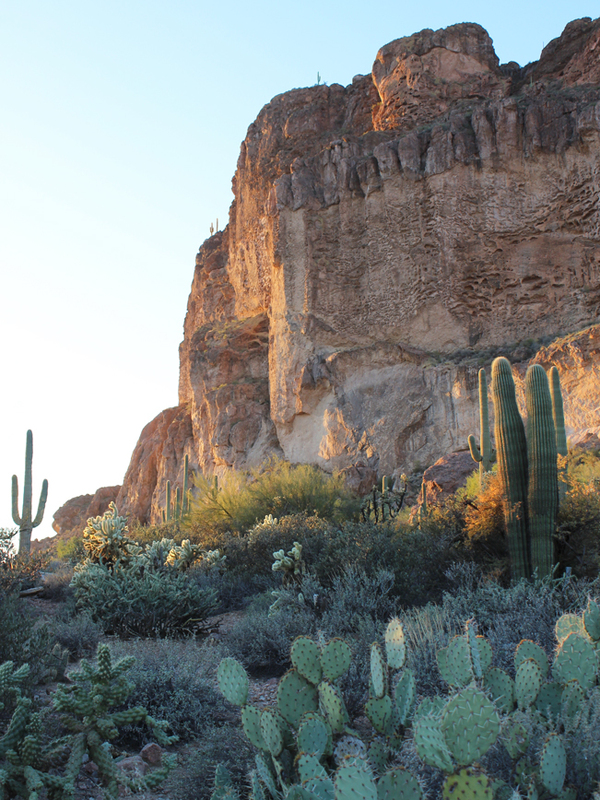 At the ample trailhead, the towering cliffs that provide passage into the trail, are bathed in sunlight – providing a glimpse of the beauty that follows. 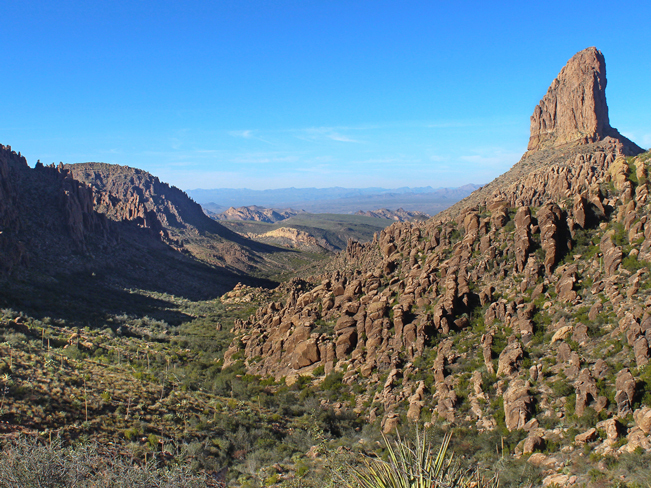 Rounding these cliffs, the Peralta Hiking Trail enters a long inner valley that cuts across the heart of the Superstitions. 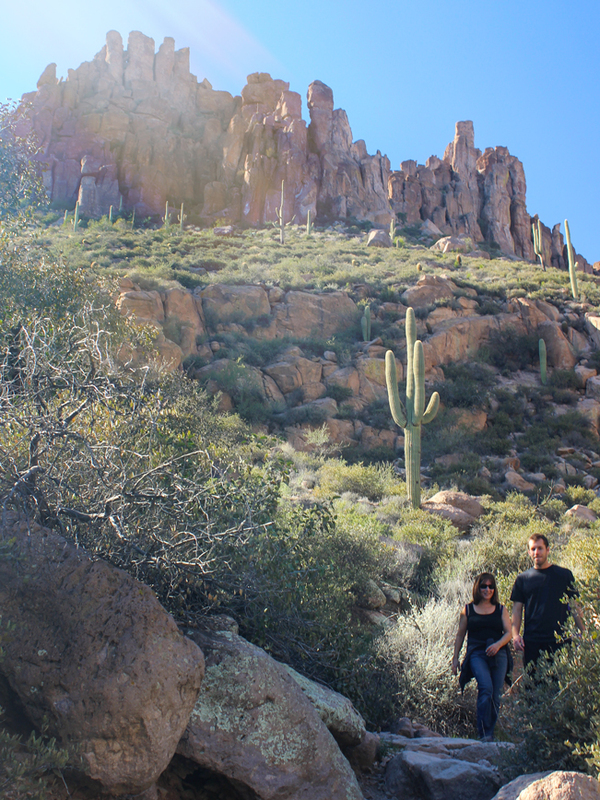 The base of the valley houses long pathways, sandy arroyos and craggy, saguaro covered hillsides. As the trail gains elevation, miles-long columns of hoodoos rim the mountains. Views back over the valley, and out between the opening cliffs, become increasingly beautiful and expansive. The second mile of the Peralta Hiking Trail steepens slightly, as it approaches the high saddle. Here the path vacillates between rocky steps and swaths of exposed granite resting alongside rugged cliffs. Small notches in the cliff bases provide shaded areas to sit, rest and take in the long valley views spreading out below. Reaching Freemont Saddle, the highest point on the Peralta Hiking Trail, lanky, multi-story hoodoos open up onto rolling views of the valley’s far side. Weavers Needle is glorious from this vantage point, standing immense and dominant over the distant landscape. Behind the needle, views span as far north as Crown King. Most people take the Peralta Hiking Trail up to Freemont Saddle and then turn around. However, for those craving a longer hike, the trail continues another 4-miles (not included in distance noted above) to its connection with the East Boulder Hiking Trail. 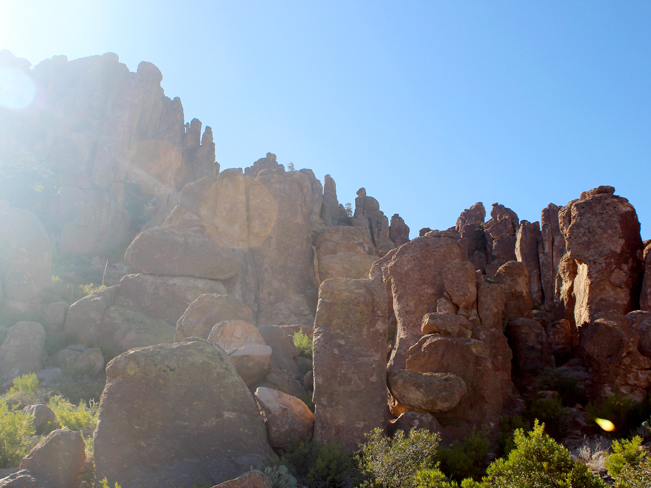 These four miles descend the far side of the valley and then curve around the back of Weavers Needle. A couple of backcountry camp sites can be found along the way. Returning to the trailhead, the views back down the valley from the top of the Peralta Hiking Trail are incredibly majestic. On one ledge a giant rock formation looks like an oversized trail cairn pointing the way. 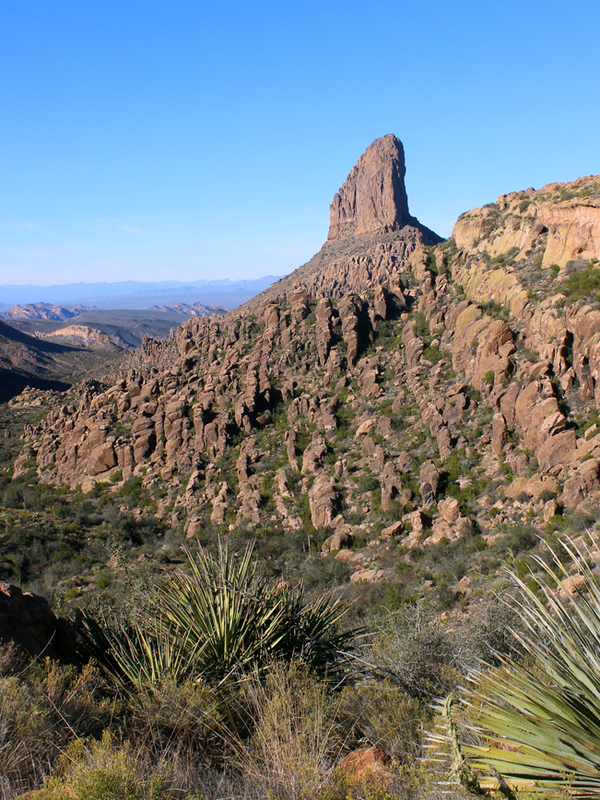 Weavers Needle is a 71-story-high, volcanic core – the remains of as eroded mountain. It can be seen from as far away as Cave Creek. Click here to download a trail map (the Peralta Trail is on the lower left corner in purple). Directions From the intersection of AZ-101 and Highway 60 in Phoenix, take Highway 60 east towards Globe. Drive for 26.5 miles on Highway 60 to East Peralta Road. Turn left / north at the stoplight onto East Peralta Road and continue for 7.6 miles to the Peralta Hiking Trail parking lot. Note: after 1-mile, East Peralta Road leaves the pavement and becomes a well graded dirt road. A high-clearance vehicle is recommended.